POWER DEMO: In March 2016, North Korea published images from the testing of a multi missile ejection system. 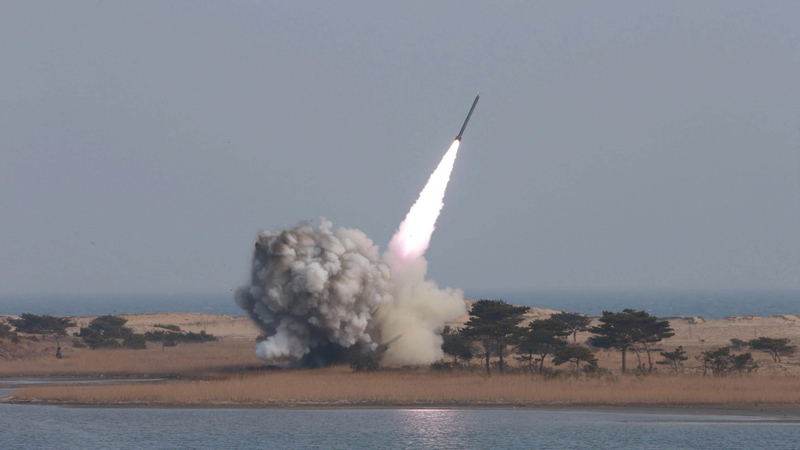 North-Korea is getting closer and closer to a de facto nuclear deterrence capability. The country tests; the UN Security Council convenes; the world condemns; more sanctions are initiated; China negotiates with the US to dilute the sanctions; the United States discusses military countermeasures with its Asian allies – and North Korea continues its nuclear and missile programs. The same cycle is repeated over and over again in a crime and punishment mode. Nothing indicates that sanctions function as intended. What could be the way out of this dangerous deadlock? Tellingly, when sanctions against Iran first were imposed in 2006, the country had a few hundred centrifuges installed. In 2013, after ramped up and more comprehensive sanctions, the centrifuges installed numbered 19 000. The world then had to find another way out – and it did, with USA as a frontrunner together with EU3 and Russia. They engaged in negotiations with Iran, and finally an agreement was agreed upon. Could this be a model also vis a vis North Korea? Although North Korea is different from Iran – more isolated for decades and with a policy of self-reliance – there are important lessons to draw upon both from the process that led up to an agreement and the agreement itself. In his article How to deal with North Korea: Lessons from the Joint Comprehensive Plan of Action, senior researcher at NUPI, Sverre Lodgaard, brings forward some recommendations for a diplomatic way of the conflict.